Stand up paddle boarding is one of the best sports of all time. The rate at which it is gaining popularity may see it become the best sooner or later. Since paddleboarding can be done on almost any water body, there is a very good chance that you will be carrying your board a lot. You also need to think about protecting your board from scratches and heat. That is why stand up paddleboard bags are an essential to anyone who owns a SUP board. Just as with everything else, paddle board bags come in different qualities. The following reviews feature the best standup paddleboard bags in the market. The SUP-Now is a premium backpack that was evidently designed with SUPers in mind. From extra padded backpack straps and handles to strong, high-density wheels, this bag screams quality. It ensures comfort to protect you from being tired and burned out by the time you get to the water. Take a look at what the bag has to offer. 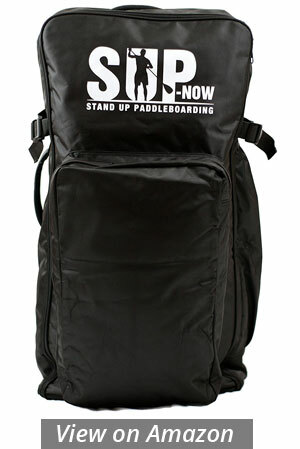 The SUP-Now backpack has high-density wheels. The bag ensures that you do not strain your shoulders by carrying it as a backpack all the time. This feature comes in handy, especially when you are at the airports. It also makes the bag look quite classy. The straps and handles are padded. SUP-Now went out of their way to ensure that you get nothing but the best. No more sore palms and shoulders. It features side pocket storage. You don’t need to keep your paddle with your board in the main compartment anymore. The side pockets are also a convenient place to keep snacks, water and any other essentials you might need. The shoulder straps can be tucked away. When you are not carrying the bag as a backpack, just tuck away the straps to prevent them from dragging in the dirt and looking all untidy. The bag is a universal fit. Whether you have the biggest or the smallest board, you are sorted with the SUP-Now. The customers say that this bag is a real life-saver. It has made carrying their boards to and fro very easy, and the trips are something to look forward to. An added advantage is that the board will not leave sand in your trunk anymore. There are no negative reviews about this paddleboard bag. Carrying your paddleboard does not have to be an uphill task anymore. The Ten Toes SUP bag is made from incredibly durable nylon and you can use it right out the box. It is of high-quality and has been sewn together with expertise. The nylon shell is exceptionally durable and offers maximum protection to your board and any other accessories. On top and on the sides of the bag there is mesh netting to ensure ventilation and lets any leftover dampness to air dry. The side and shoulder straps are adjustable to allow easy storing and transporting and it has torso straps for enhanced distribution of weight. It has a front zippered pocket for your accessories. 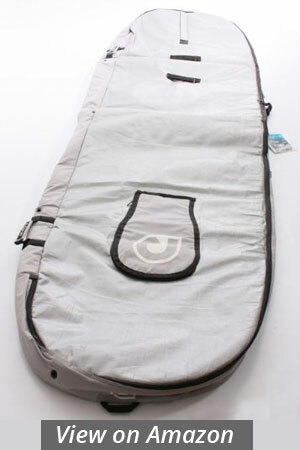 If your SUP board is from Ten Toes, it will perfectly fit in this bag, regardless of the size. 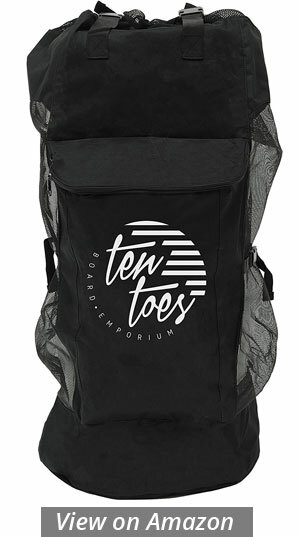 The Ten Toes paddle bag seems to appeal to the users. It has plenty of room for their boards, accessories and whatever else they need while paddling. It is also durable and of extremely high quality. 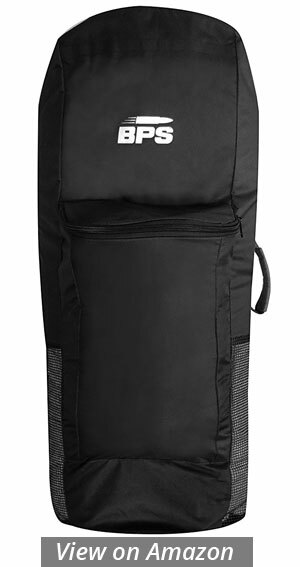 The BPS Premium iSUP bag is the work of an experienced paddle boarder. It can fit any inflatable paddle board, as long as it is 12’6 long and 34 inches wide. This amazing iSUP bag comes with all the features you would ever need in a SUP bag—and many more. It measures 39.37” x 17.72” x 14.17”. Its size allows sufficient space for the board, pump and any other accessories you need. You can carry this bag in four different ways and prevent a lot of soreness and muscle cramps when carrying it over a long distance. It has extra handles on top and on the sides. The shoulder straps are padded and have a large adjustment range to fit various chest sizes easily. There is also a chest strap to help distribute the weight for added comfort. The BPS Premium bag features a padded layer between your body and the board to make you even more comfortable while transporting your iSUP. The bag has mesh panels so that any leftover wetness on the board will dry. There is an internal pocket at the rear of this bag (sealable with Velcro) for storing your paddle and ensuring that it does not hurt your back or drag things along the road. The general feedback from the customers is positive. They love the multiple handles as they make everything easier, from picking the bag up, putting it in the trunk and carrying it. The side mesh is also making an impression since the boards are never fully dry when being packed into the bags from the water. Some users complain that their pumps did not fit in the bag properly. 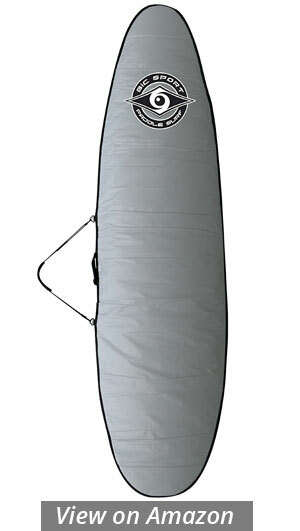 The ISLE Inflatable SUP bag is made of heavy-duty nylon to ensure that your board is properly protected from the elements and scratches when you store it. The material also serves to increase the bag’s durability. It fits a wide range of board sizes and it may be just what you need for your iSUP. It is made of heavy-duty nylon outer shell for added durability and increased protection. If you store your board in the garage where anything can fall on it, this bag is ideal as nothing can scratch it easily. 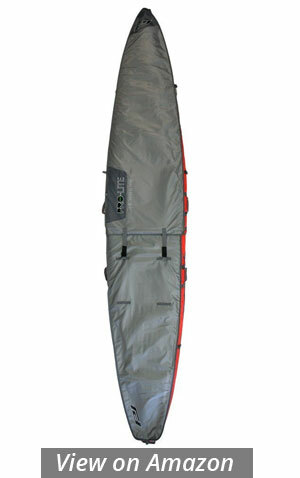 The ISLE Inflatable SUP Carrying Bag has waist and shoulder straps to make the task of transporting it even easier. The waist straps help to distribute the board’s weight so that your shoulders do not bear it all. It features an outer bungee system for you to store your board pump. Some bags do not come with this feature which is such an inconvenience. It fits most iSUPs. The bag measures 36 inches x 14 inches x 12 inches and can accommodate boards up to 12ft 6inches. The bag has acquired a lot of positive reviews. Users say that it is fantastic and convenient. Some of the things that have been mentioned in the reviews include the ease of cleaning it, nice ventilation; it is light and dries fast. A few customers feel that it should have side compartments for accessories. Tower Paddle Boards are known for making outstanding paddleboards. As expected, their Tower iSUP Backpack has been made with the same skill to help you take your iSUP wherever you want. The bag is spacious enough and offers few, if any, restrictions. The Tower iSUP Backpack fits the Adventure 9’10”, Adventurer 2 10’4” and the iRace 12’6” inflatable boards from Tower Paddle Boards. The bag is big enough to fit your board, pump, and paddle. It has an interior zipper where you can store the fin. There are backpack straps at the back of the bag for easy carrying. 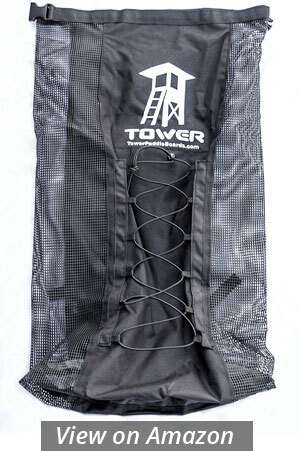 The Tower backpack has bungees for you to carry accessories and necessities. You can store water, snacks and beach towels among other necessities. It features a Velcro and snap top closure. Seeing what the customers have to say, it is evident Tower Paddle Boards do not disappoint. They say that the board is of excellent quality and it has made their lives much easier. It is large enough for their boards, pumps and whatever else they need while paddling. The AOM ING iSUP paddleboard bag from AOM is a great budget iSUP backpack for any paddler out there. It is designed to make those trips to and from your paddling spot more enjoyable. It has a mesh netting which facilitates the drying of your iSUP. This idea is very thoughtful as the little dampness left on your board can reduce its durability. It is huge enough to fit your board and some other accessories. It has shoulder and waist straps for easier distribution of weight. The straps are well-attached to bear the weight of your inflatable paddleboard. The ING iSUP Backpack has a durable nylon outer shell. Users are generally pleased with this iSUP backpack. The only issue is the strong solvent smell. That, however, can be solved by airing the bag before using. The Curve SUP travel bag is purposely designed to protect your paddleboard and paddle from scratches and the elements. It is ideal for carrying your huge stand-up paddleboard. This bag ensures that you travel comfortably, whether by plane, boat, train or vehicle. Take a look at some of its amazing features. It has a simple built-in paddle holder for you to store your paddle and free your hands. The holder has extra padded protection for your paddle blade to prevent it from digging into your back. The shoulder strap is non-slip, double adjustable and has extra padding and impact resistant buckles. You can be sure they won’t let you down when the board is on your back. The Curve 10mm Heavyweight features multiple integral air vents to enhance air circulation and the drying of your board. There are extra handles at the nose and tail which makes it easier for two people to carry the board—if necessary. It has an internal storage pocket and adjustable fin slot. The bag has a YKK zip closure that runs through the length of the bag to give you full access to your board. It features heavyweight 600D water-resistant silver Tarpee upper and Polycanvas base. This bag seems to be the best thing that has ever happened to SUPers after the sport itself. It seems to meet and even go beyond the expectations of every user. They love it. Say goodbye to heat damage and minor dings with the BIC SUP Board bag. This bag is designed to fit all BIC Sport SUPs perfectly. It is skillfully made with very durable material to ensure that it serves you for the longest time. It is made of heat resistant and extremely durable PolyPro fabric. Rest assured that it will not be tearing anytime and your board is fully protected. It has a reflective deck and hull material which minimizes heat exposure if left under the sun for a long period. The rails, tail, and nose are made of durable 600D material and 5mm foam padding for increased protection. It features a paddle holder and multiple carry handles to make things easier while transporting. The zipper on the BIC SUP bag is extended to allow for easy loading and offloading of your stand up paddleboard. According to the customers, this bag is great and does a good job protecting the board. It also makes traveling way easier than before. The only problem seems to be the handles that keep breaking off. The FCS SUP Day Bag is the perfect bag for everyday mobility. It gives your board more insulation than you can get from a board sock and saves you the weight and cost of a travel bag. The material is heat resistant and very durable. It has enough space to hold your board, paddle and accessories. 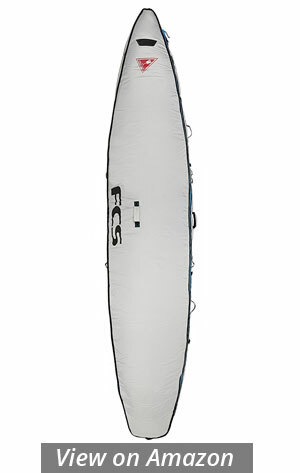 The FCS paddleboard bag comes with a fin slot. It features high-density 5mm cell foam padding. It is made of Tarpee material that reflects heat when it is out in the sun for long. The handles and shoulder straps are ultra-padded for added comfort. Going through the reviews, you can tell that this bag is a quality product. Some users even plan on buying a second bag for their other paddleboards. The SUP ATX Bag is a premium-quality travel paddleboard bag designed for easier and safer transportation of your board. The bag comes with various great features, as seen below. The SUP ATX Deluxe is heavily padded and sufficiently protects your board from dings, heat and any other damage. Though it is made of heavy-duty material, the bag is surprisingly lightweight and it will not strain you. The bag is made from very high-quality material and parts like huge rust-proof zippers for durability. It features a fin slot that has a zipper for when you want your fin attached. It also has pockets for all the accessories you would like to carry to the beach. There is an integrated paddle holder which makes the bag pretty cool. It has a rubber handle to take care of your hands when you are traveling a long distance. The customers seem to love this bag. It is exactly as advertised and protects their boards. The negative feedback is mostly from users who got a size smaller than they ordered. But it could be an honest mistake. 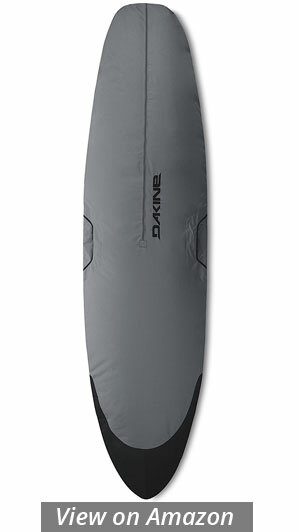 The Dakine SUP Sleeve protects your board against dents during traveling. As much as minor scratches are nothing to worry about, one deep dent or heat damage can destroy your board. The Dakine SUP Sleeve, with its outstanding features, is designed to make sure your board lasts as long as you (or longer). The Dakine Paddleboard bag has a water and heat resistant tarpaulin bottom to ensure that your board is protected from heat damage. It is ideal for boards that are up to 9’6” long. Therefore, it can accommodate a wide range of board sizes. The top is made of tough 600D polyester for enhanced durability. It can withstand abuse without getting all tattered. The top zipper and fin slot zipper provide for easy entry making it simple to use. The nose and bottom are ultra-padded with ¼” of Foam to give your board maximum protection in the vulnerable spots. It features compression straps to offer a secure and perfect fit. Judging from the feedback, Dakine did a great job. The bag offers great protection and easy transportation. Its durability and sturdiness are praised a lot in the reviews. Some users wish it came with shoulder straps for easier carrying. However, if you go with your car to the beach, that is not much of a problem. 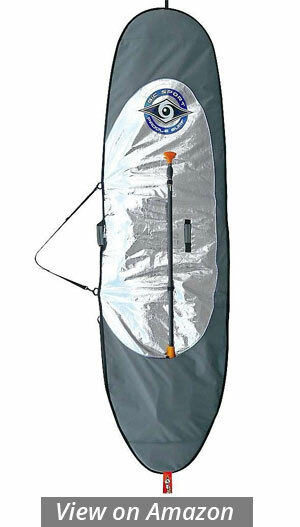 The BIC Sport Silver paddleboard bag is one of the best SUP bags in the market. The bag has been made of durable material to protect boards of various sizes from dings and the elements. It also makes it easier to transport your SUP, with or without a car. It is made of a heat-resistant PolyPro fabric for durability. It will not be easy to get a tear in this bag. The zipper is extended to make it easier to get your paddleboard in and out. SUPs are big, and squeezing them through small spaces can be a frustrating struggle. It has an integrated padded shoulder strap and carry handle, so you have two ways of carrying your board. The zips are heavy-duty to last longer. 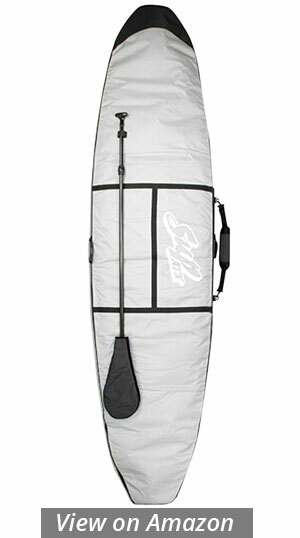 The Pro-Lite SUP Session bag is a special design by Pro-Lite and John Becker for touring and race boards that have a pulled in nose and tail. It is cut 28.5” wide with a 4.5” gusset to fit displacement hulls. The bag is totally zipperless and has a 420 denier reflective nylon, in addition to 5mm foam protection. It features six external compression straps and a strap pocket to tuck the straps and other accessories while traveling. The shoulder strap is padded and has a Velcro closure system. There are also five padded handles for enhanced comfort. The bag has an external pocket, two vents for cross-ventilation, four tie-down loops, reinforced nose, inner storage pocket and red flags for oversize warning. Its shortest adjustment point is 12’6. It cannot fit a shorter board. The bag is of high quality, according to users. They love that it is easy to slide the board in and out and it is durable. There are no negative reviews but a user did mention that the bag does not look good—which depends on an individual anyway. 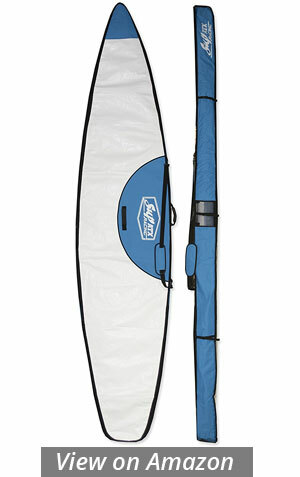 The SUP ATX Race Board Bag is made of heavy-duty material and extra padding for extra protection of your board. It has several great features as you can see below. Made from heavy-duty nylon and has extra foam padding. Whether your board is outside, exposed to the elements, or you are transporting it on the roof of your car, this bag will ensure that it does not get damaged. It features durable, heavy-duty zippers and a coffin style opening (which provides for easy access), fin slot, shoulder strap, venting and 10mm padding on the entire bag. 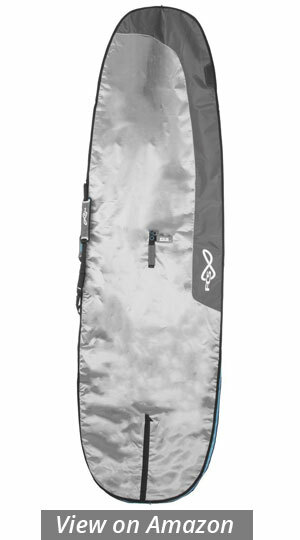 The bag accommodates boards with a maximum width of 33.0” and a maximum thickness of 5.5”. This bag has nothing but positive reviews. Customers say that this is a great product, very much worthy of its price. There are no negative reviews on the SUP ATX Race Board Bag. The FCS Racing Board Bag will take care of your touring/racing board and prevent it from wearing out quickly. It is made to fit boards of up to 31” wide comfortably. 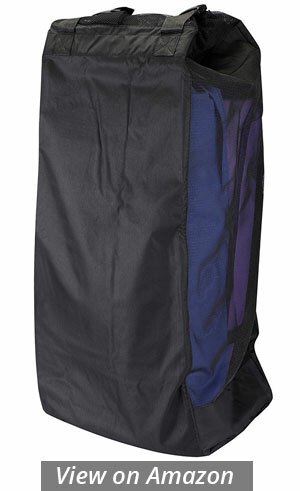 The bag has full-length durable marine zippers that will not corrode and provide easy access to the board. You will have no trouble fitting your board in the bag or taking it out. It has eight compression cinches to allow for safe and convenient transportation. It features 5mm closed cell foam to protect your board wherever you leave it. The FCS has a reflective built-in air vent and reflective silver paneling for sufficient air circulation. It has a reinforced nose and tail area. Most customers have never paid so much for a bag. However, they are very pleased with it and they have no regrets. It protects their even more expensive boards from the elements and dents. 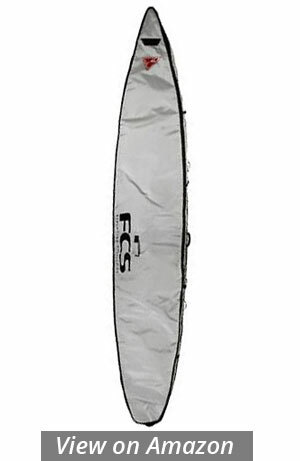 The FSC Race Board Bag is an ideal stand up paddle board bag for day to day use. It is made with so much skill to protect your board while stored in the garage, left in the sun or while you are traveling. The bag has an airflow system that enhances the air circulation inside the bag. It features a heat reflective silver paneling to protect your board from heat when left out in the sun. It has eight compression cinches. The FCS has a heavy duty zipper and coffin wall construction. The general reviews for this product are positive. The customers say that it is durable and highly protective of their boards. It may be a little heavy, but that is nothing compared to the service it gives. Everyone with a SUP needs a SUP bag. Since the boards are used mainly outdoors, and others are stored in the garage where they can get scratches and dings, not having a bag is risking your board. The above standup paddleboard bags are all great. They offer great protection and make it easier to carry your board from place to place. Whether you own a racing board, an inflatable paddle board or just a traditional fiberglass board, get a bag that best suits your board.